GetMyMachine is india's only marketplace dedicated to Injection Moulding Machines enabling buyers to view Injection Moulding Machines in MAHARASHTRA and connect to vendors serving MAHARASHTRA. Similarly Injection Moulding Machines vendors in MAHARASHTRA can see all the Injection Moulding Machines valid requirements in MAHARASHTRA and connect with the buyers to offer their best pricing. Description : Molding industry is growing steadily and the demand for good quality molded parts is increasing day by day. The requirements are always challenging and need expert solutions. In order to meet the required quality standards, the molding shop should have Injection Molding Machines that are versatile. De-Tech is a midlevel closed loop injection molding machine that is versatile and would cater to most of the diverse molding applications.The heart of the De-Tech machine is the electronic variable displacement pump which caters to the operations in the molding at the exact demand thereby conserving energy. The De-Tech series of machines is a work horse and comes with the proven LNC6 control system from Toshiba Machine. The De-Tech machines have a modular design and offer a choice of variety of injection units to suit the product application precisely. Description : We are very reckoned manufacturer, exporter and supplier a sufficient assortment of Injection Molding Machine in Ahmedabad, Gujarat, India. Provided Injection Molding Machine is made using premium quality raw materials and advanced technology in compliance with international quality standards. Offered range of Injection Molding Machine is highly loved by the customers for it quality and sturdiness. 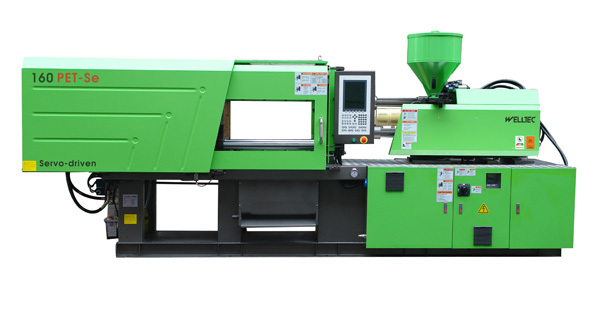 We offer this array of Injection Molding Machine at very fair prices. Description : S09 smart control system Software & Functions European imported from B&R Automation, professional control system for injection moulding machine 10.4” TFT colour LCD display Parameter change logging, user can know who change the data and the scope of data changed Quality control statistical process data, proves the stability of machine Excellent energy-saving effect The newly developed “Se?” Greenline energy saving series injection moulding machine adopts the advanced servo-driven pump system and integrates with our 25 years manufacturing experience on plastic machinery. When comparing with traditional design injection moulding machine, it can achieve energy saving 25~85%. That saving effect is most significant on both holding and cooling phases. High repeatability on moulding Result from the adoption of servo-system, the injection pressure and speed are real time closed loop control. High stability and repeatability of servo system enhance plastic processing quality. Description : Bi-alloy Screw & Barrel specially applied to BMC material. Abrasion-resisted / Etchingresisted. Capable with glass-fiber material. Stabilized mold temp . controller improved thermosetting Process. Platen with insulating board . High temp . & Pressure resisted. Temp. protection device for screw barrel. prevent temp. increased from charging by high speed / back-Pressure. Description : Big diagonal type design,fast and smooth opening closing. Bigger ejector stroke Higher tie bar space and clamping stroke Flexible front platen design, with large area, deformation. Faster heating, and precise temperature control Professional plasticizing units for different engineering Plastics. Modularized design, offer customers with more options. Two parallel pillar guide design. Injection is stable & precise. Description : Backed a team of hardworking professionals, we have been able to manufacture, export and supply an exclusive array of Plastic Molding Machine in Mumbai, Maharashtra, India. This range of Plastic Molding Machine is assembled employing quality assured and with the help of sophisticated technology according to the set industrial standards. Our clientele can avail them at industry leading prices.